It was a very busy weekend for me. 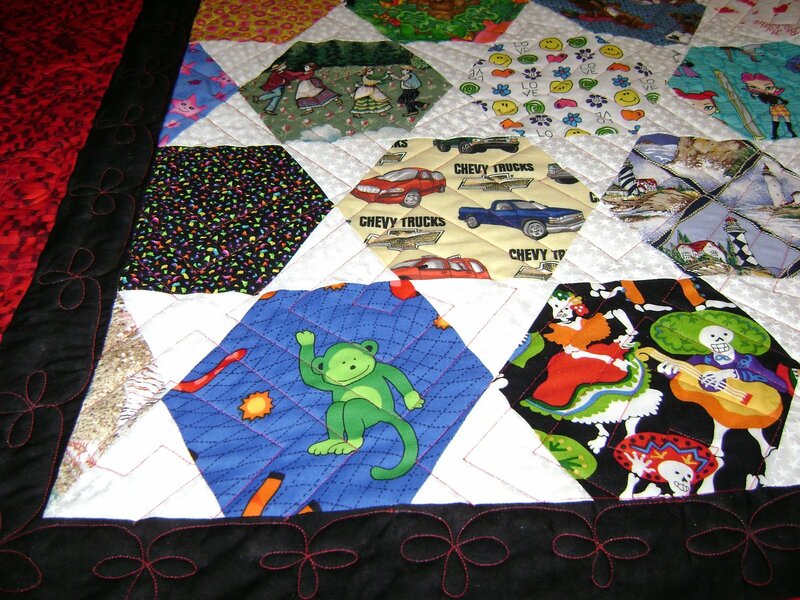 My sister in law was here on Saturday for help with her quilts. In the afternoon my brother had a kidney stone episode and I drove him to the hospital. We sat there for several hours without him ever seeing a doctor. The stone finally passed and the pain went away so we left. Sunday my grandaughter was here so not much work got done. Here is today’s finished quilt. The last of the three I spy quilts for this customer. I used the circle lord square dance on the center area. The customer’s choice. I did a loop design on the inside border and a flipping C star on the outside border. I plan to work on a sampler quilt today. I’m hoping to get it finished but I also have some house work I really need to get done too. I’ve started gathering thoughts and making some notes for a set of new machine quilting classes at the shop. There is a new quilting machine at the Happy Heart Quilt Shop! It’s waiting to be put together. Somehow I’ve got to find time in my schedule to go help move things around and help set it up. I’m sooooo excited! Now I can actually do classes instead of just demonstrations. Oh the possibilites! Not just how to load a top and stitch it with stippling either. I’m thinking of progressing classes. Starting with the basics and progressing from pantos to freehand and heirloom. 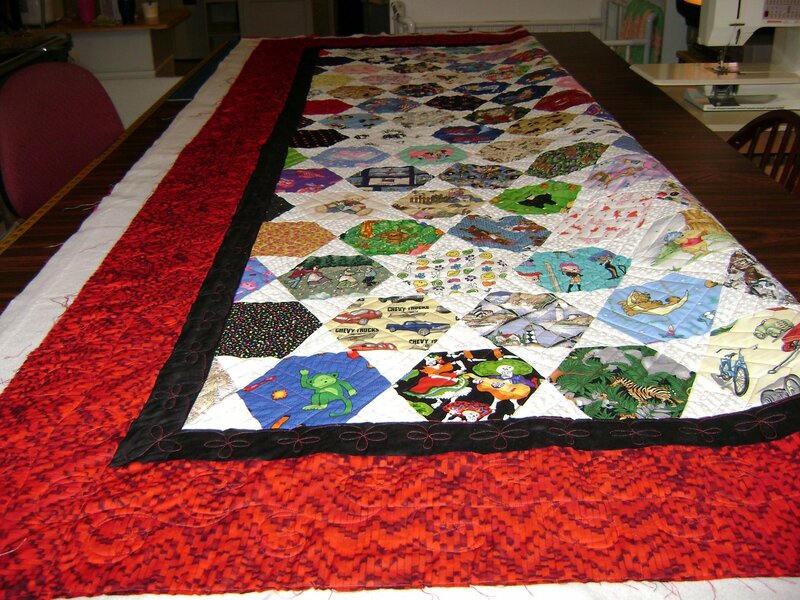 Maybe some whole cloth classes and even some piecing on the quilting machine classes. I’m also worried that I won’t be able to fill up a class. The last class I had there was only one person. I couldn’t really teach her anything without a machine but I did my best with paper and pencil. A new machine means I can show a technique and let the students give it a try. I’ll be able to really teach. Who knows…. maybe I can even get the shop owner started machine quilting. Why would I be willing to teach others how to machine quilt when I’m in the business of machine quilting? Despite my desire to live forever, it’s not possible. Tomorrow is not promised to anyone. I want to pass along what I know before it’s too late. Not everyone can afford to buy a quilting machine and not everyone will have room for one either. I’ll still have customers to work for and pay my bills. Ok, there’s a storm about to pass through this area. I hear thunder and see lighting so I best get off the computer and start my workday. 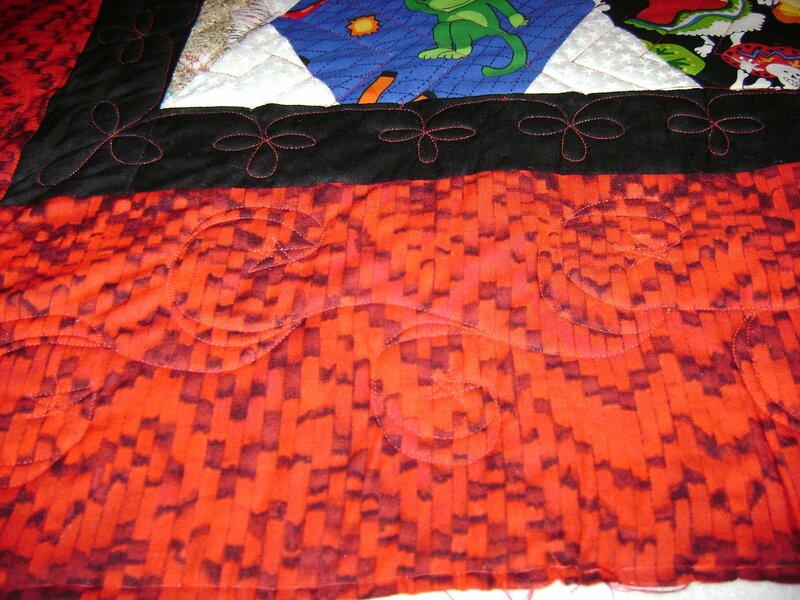 This entry was posted on September 9, 2008 by Anita in Circle Lord quilting, QUILTS - CUSTOMER.